Travels in Ndeke Luka, our overland camper. They had live music there the first night and we listened until we got too depressed by the country music they were playing. None of the songs ever end happily! So we went back to the 917 and fixed dinner. That did end happily. 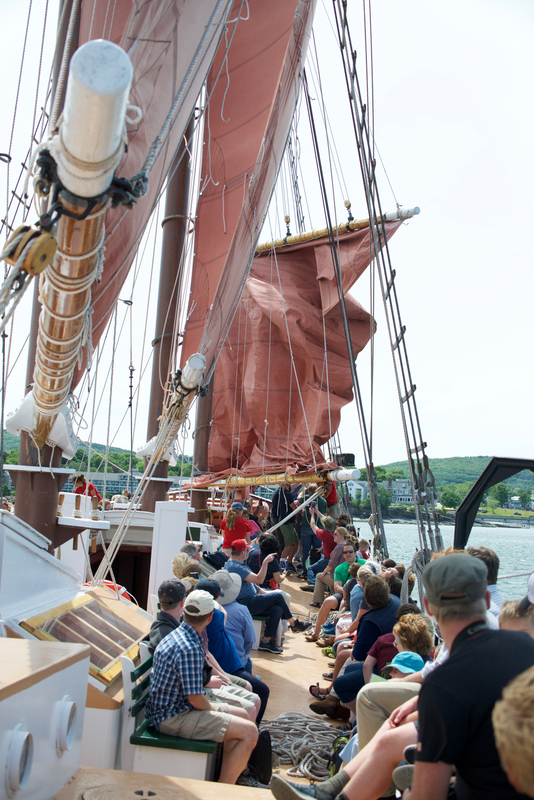 The next day we walked the small town and booked a whale watching cruise on a tall ship. (http://jollybreeze.com). The sun went in before we boarded and it was a chilly afternoon on board but a cup of hot chocolate followed later by homemade pea soup, warmed us up. we saw a couple of Minke whales, plus a selection of basking seals and several porpoises. 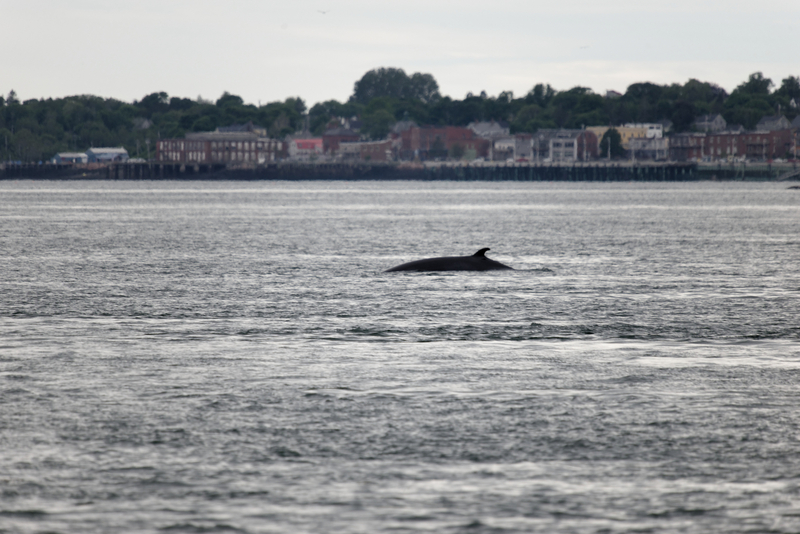 Minkes are not exceptionally large whales, but they do meet the test of having-seen-a-whale. It was a well run and fun cruise. Fred spent much of the voyage chatting with the owner’s father, who was crewing. The Jolly Breeze was built in New Zealand from the plans of an English pilot boat. 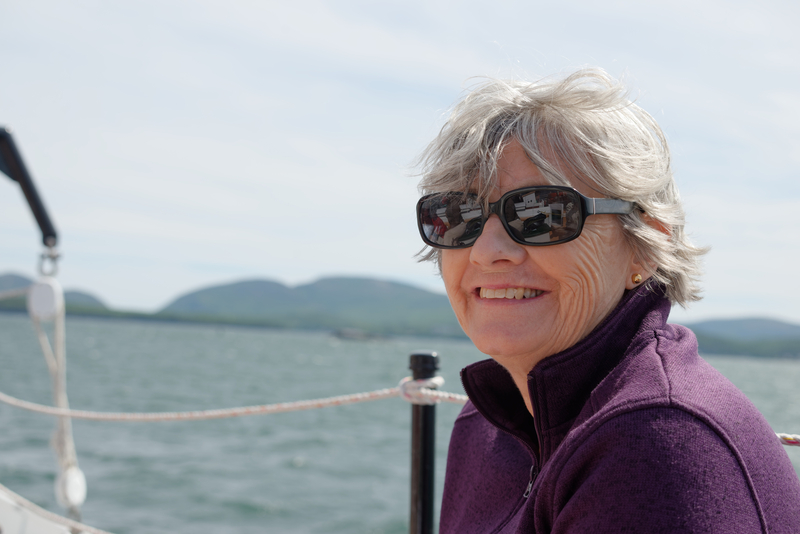 Denise has noted and enjoyed a mass of lupins wherever we are both in New England and Maine and now in New Brunswick. It brings back memories of reading the children’s tale “Miss Rumphius” to our daughter when she was small. She even bought a Miss Rumphius t-shirt with a scene from the book. Lupins do not grow wild in Virginia! Lupins were to become a constant theme during our time in Canada, flowering along almost every road. We decided to visit the Museum of New Brunswick in St. John’s so we went to the campground in Rockwood Park. (http://rockwoodparkcampground.com) A lovely spot; a huge park only about thirty minutes walk from the old downtown. We headed into town on foot, enjoyed the museum and a cup of coffee in town before heading back. — Black Nova Scotians. 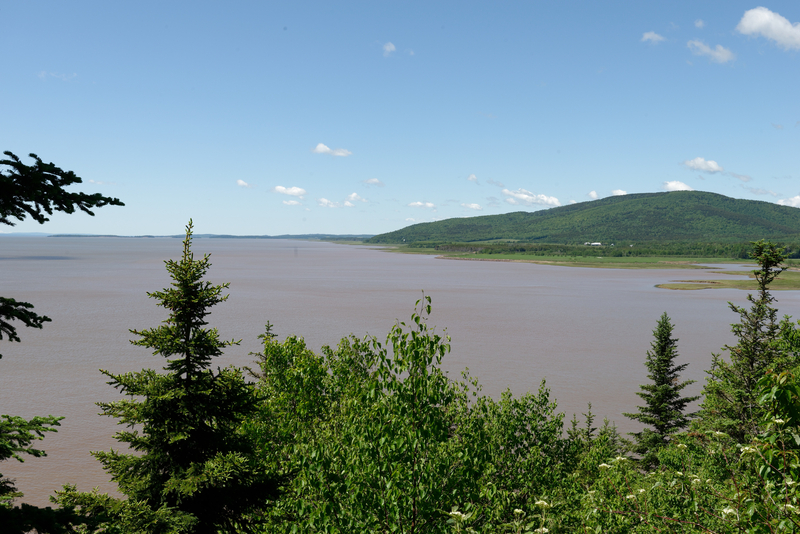 The ships carrying loyalist refugees to Canada had an odd admixture of black passengers – free blacks who had gained their freedom by enlisting in the Royal Army, and, on some of the same ships, enslaved blacks being taken by their loyalist owners to Canada. — Militias. It is an article of faith of (too many) Americans that we won our independence with home brew militias that somehow defeated the regulars of the Royal Army. The truth is very different – rebel militias were notoriously unreliable, prone to desert at harvest time and unable to withstand the fire of British regulars. Washington depended on the Continental regulars and thousands of French soldiers to win our independence. (A tip of the hat to Benjamin Franklin, John Adams, and our other first diplomats for negotiating with the French for ships and troops and with the Dutch for recognition and money.) In fact, there were more French troops at the battle of Yorktown that Cornwallis was not entirely out of order wanting to surrender to the French. What all of this have to do with loyalists? Only that there were loyalist militias as well as patriot militias and, with the end of the war, they wanted to escape the United States to avoid retribution. One of the attractions of downtown St. John is the preserved loyalist house, survivor of innumerable fires and urban development. We think our round trip was probably close to 4.5 miles with the last part decidedly uphill! So we stopped by the lake in the park to listen to live music and enjoy a glass of wine before tackling the last hill to the camper. An enjoyable interlude. 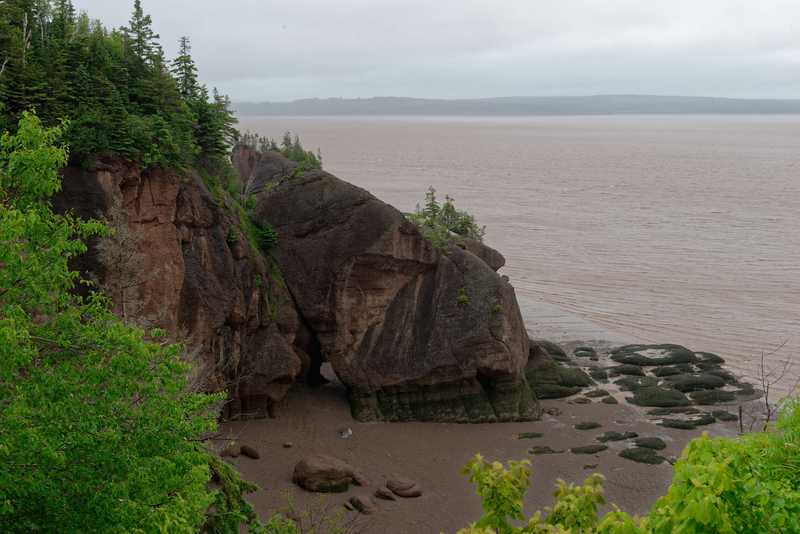 Leaving the next morning, we headed towards the Hopewell Rocks (https://en.wikipedia.org/wiki/Hopewell_Rocks) to discover all about huge tides (up to 46 feet) of the Bay of Fundy. 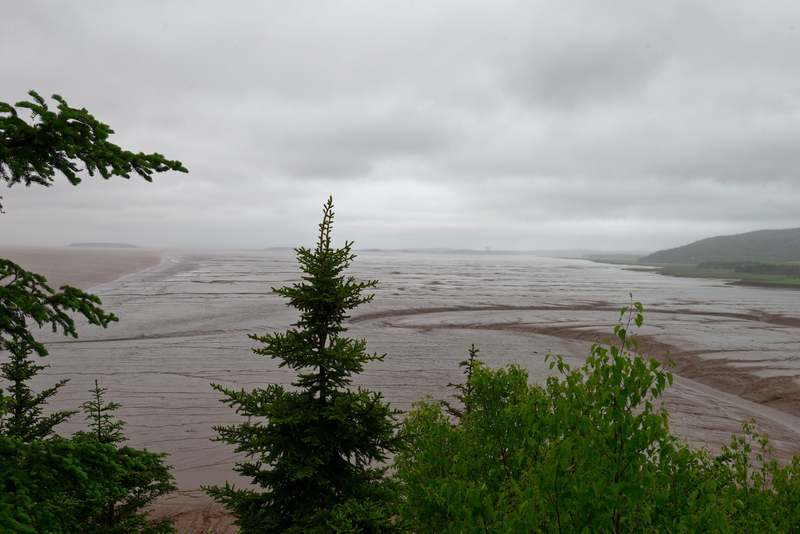 We checked into the Headquarters Campground of the Fundy National Forest (https://www.pc.gc.ca/en/pn-np/nb/fundy/activ/camping/avantpays-frontcountry/administration-headquarters) and watched the rain fall. 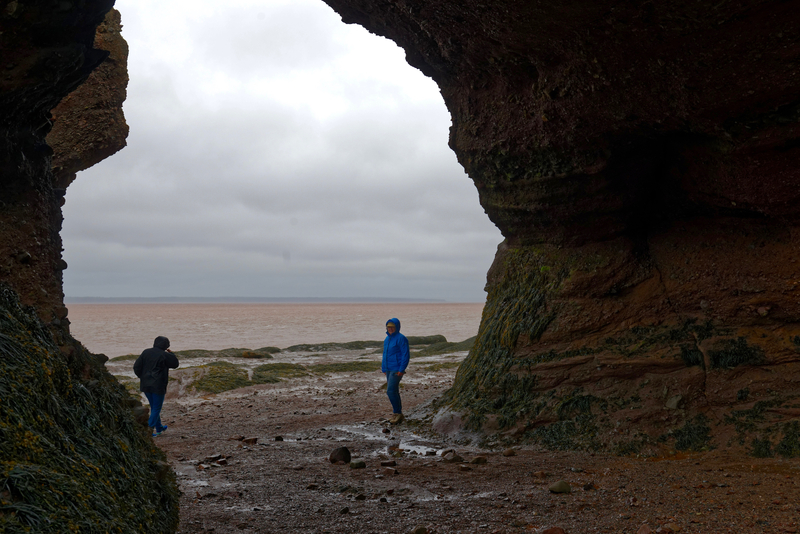 As the afternoon progressed, it began to clear a little so we added layers and raincoats and headed for the Rocks as it was almost low tide. It was indeed amazing. 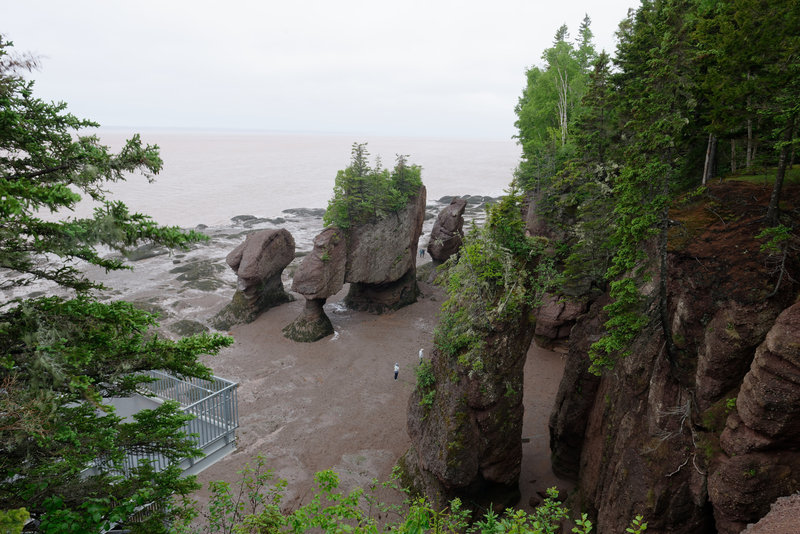 We visited all the viewpoints and descended to the beach where we ambled among the shaped rocks on the sea floor. Somewhat chilled, we headed back to our campsite for dinner. We returned in the late morning of the following day and with much better weather, and duly admired the views with high tides, this time in shirt sleeves! The “rocks” themselves resemble nothing so much as the “temple” monoliths of the Capitol Reef in the western US being made of compressed earth with lots of rocks mixed in. Denise down on the sea bed. This entry was posted in RV Travel on July 6, 2018 by DiploStrat. The Norcold two door refrigerator had given us problems from the very beginning. We took it to a Thetford dealer in Manassas, Restless Wheels, who had twice performed warranty service on it, replacing first the cooling system and then the thermostat. It completely died during our visit to Portsmouth, NH and we were managing with a limping refrigerator, which worked sometimes, and an ice chest. 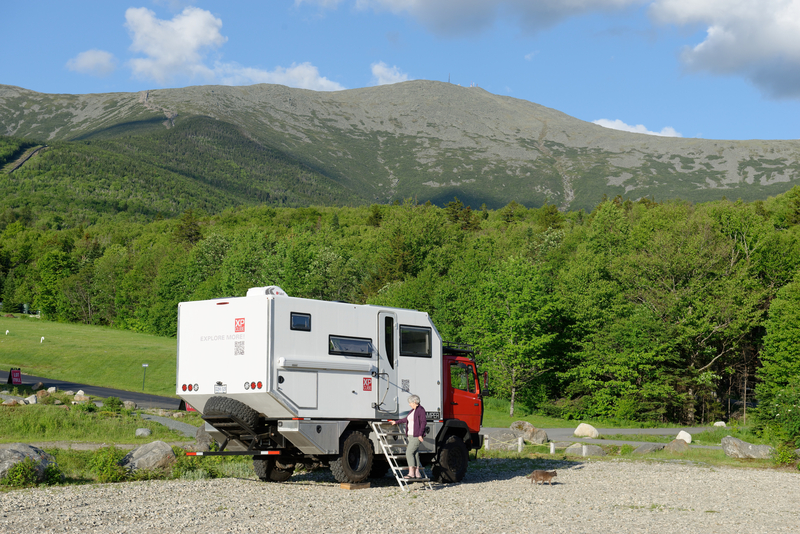 We found a dealership, Harvey RVs, in Bangor, Maine who were prepared to replace it under warranty and so after our stay in the Acadia National Forest, we headed to Bangor to confirm the arrival date. (https://www.harveyrvs.com) We expected to be told that it was due the following week, so we had made plans to visit friends in Portland. But first we made a preliminary visit to Harvey RVs as we wanted them to see the layout of the camper and look at a broken drawer. Upon our arrival, we were mobbed by salespeople, all admiring the XPCamper. If the Tiger drew attention, the XP draws crowds! Took a few minutes to discover that the service section was actually about a quarter mile deeper into the site. When we got back to Service, we learned that rather than arriving next week, the refrigerator had actually arrived an hour previously and Harvey was ready to install it that very afternoon. So, we gleefully removed all our stuff and left them to it. Technically, it takes 30 minutes to install a Norcold refrigerator. Practically, the fridge is too large for the door and it had to be installed through the skylight. 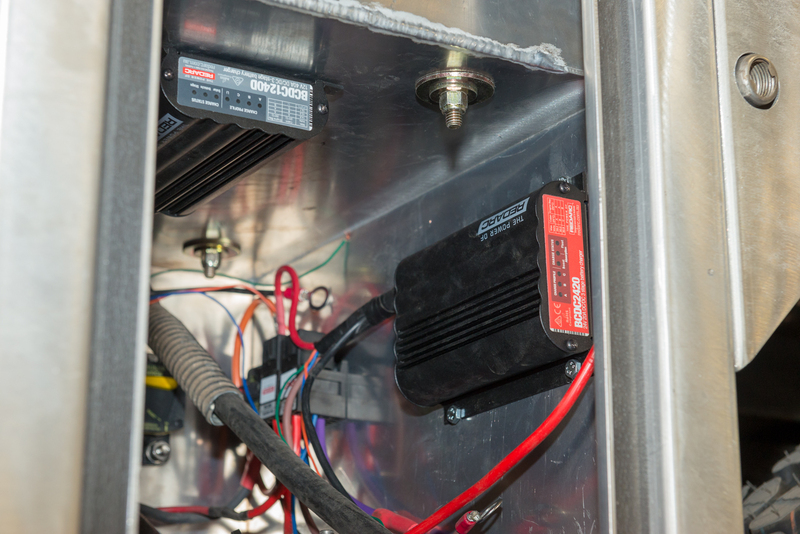 We were a bit annoyed, but the Service Manager at Harvey merely snorted that that is a common problem and that with the proliferation of large residential refrigerators in large Class A RVs, they often have to remove a slide to replace a refrigerator. Our skylight caper didn’t look so bad, after all. We had made plans to visit Tiger owning friends in Portland, Maine, but, the refrigerator having arrived early, it was all change to staying in Bangor. One of Fred’s imaginary friends from the Internet is Kirk Ramsay who is, among other things the owner of Ramsay guitars. Our first stop that evening was to the downtown offices of Ramsay guitars where Fred and Kirk disappeared into the basement to ooh and aah over blanks of wood. So now there are two new guitars that Fred wants! (http://www.ramsayguitars.com) Several famous electric players have commented that you don’t have to plug in an electric guitar to tell if it is any good, you just have to strum it and see if it rings. Kirk’s guitars ring like bells. Let’s just say he knows how to make a neck joint! As to the rest, the actions are great and the finishes? Off scale beautiful. We then repaired to the High Tide for a lovely dinner overlooking the river so that Fred could recover. After a night at the scenic Ramsay campground (Five stars! *****) we were back at Harvey RVs for some adjustments to a drawer which had developed the annoying habit of opening while we were driving along. This site is going to develop a “Best of the Best” section where we will list the best campsites and other services that we have encountered. Harvey RVs will be one of the first entries. The Service Manager had one of the best lines ever: “Well, all we can do is fix it.” Oh that some others had the same attitude. This entry was posted in RV Travel on June 29, 2018 by DiploStrat. Our first night in Maine was amazingly warm, with temperatures in the high 80’sF. We thought Maine was supposed to be cool! We have not had this camper long enough to really know how long we can run the air conditioner on the batteries, though we have successfully run it for several hours. 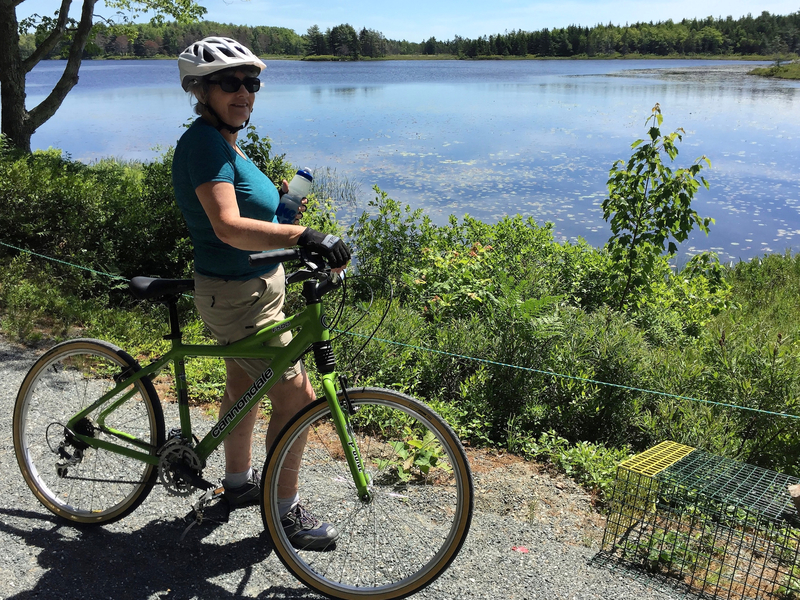 So, rather than a Walmart, we picked the Twin River Campground at Skowhegan, Maine, where we knew we could get shore power. 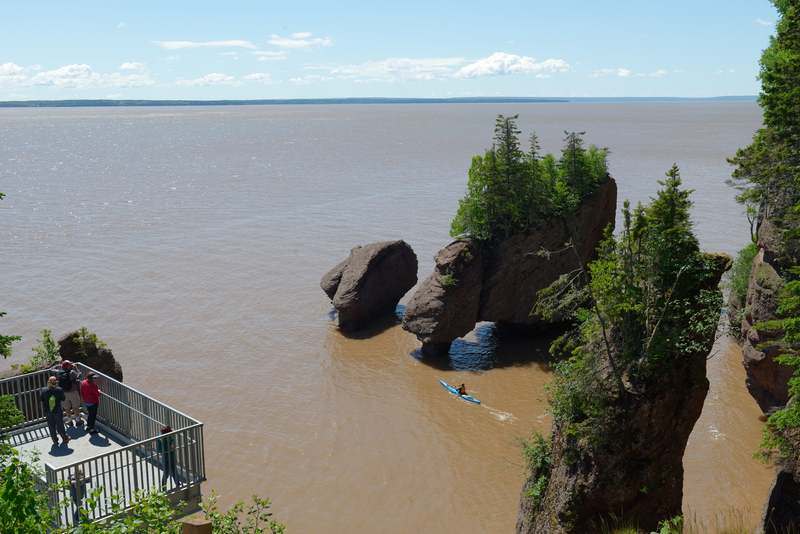 We were offered a waterside site, with the caveat that there was a pot luck dinner and pig roast taking place and it might be a little noisy for a while. We agreed that we could live with that and headed to our site which had cars parked on it! Once that was all organized we sat outside to enjoy the view and enjoy a glass of wine. Our solitude was brief as all the neighbors came over to say “hello” and those holding the pig roast immediately invited us to join their dinner. This massive spread, fresh off the grills, looked much better than our leftovers so we accepted with great pleasure and enjoyed a social evening meeting charming people who spend the summer season at this campsite enjoying the boating and the outdoors. 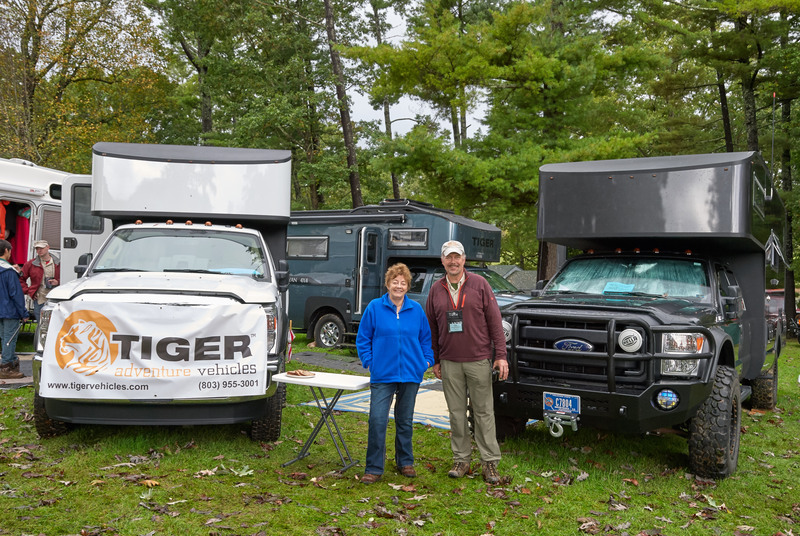 While we learned about the concept of seasonal RV camping, they lined up for tours of the XPCamper, noting that it is not at all like the usual RV. The next morning we were thinking about coffee and breakfast when a knock sounded on our door. 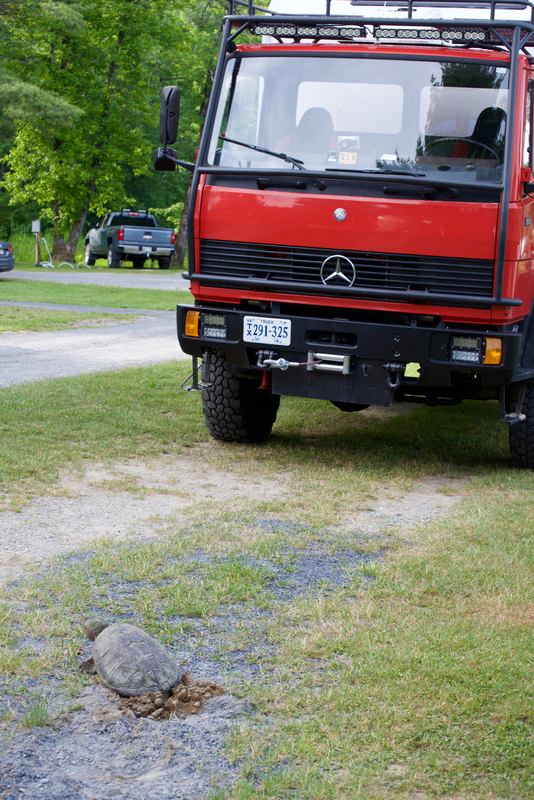 Our new friends wanted us to know that a snapping turtle was laying eggs in front of our camper so of course we went out to look. It took Mrs. 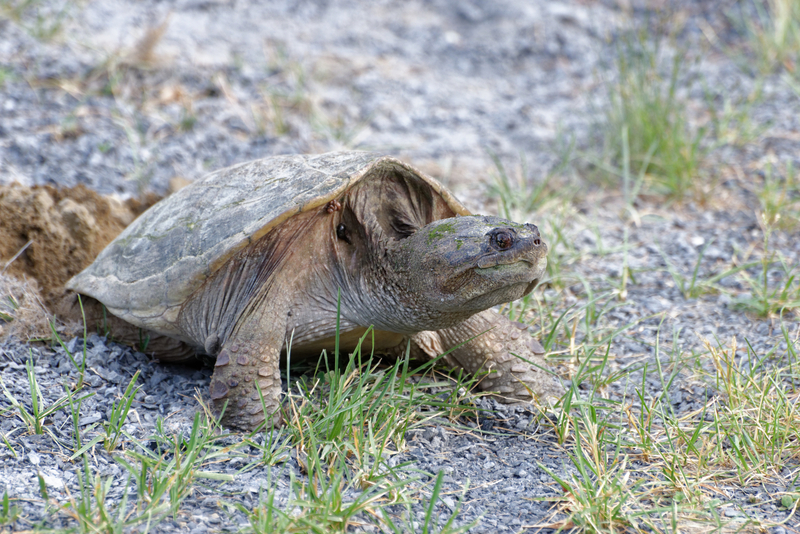 Snapping Turtle at least an hour to complete her task and then she returned to the lake! Fortunately we were not ready to leave before she had finished. 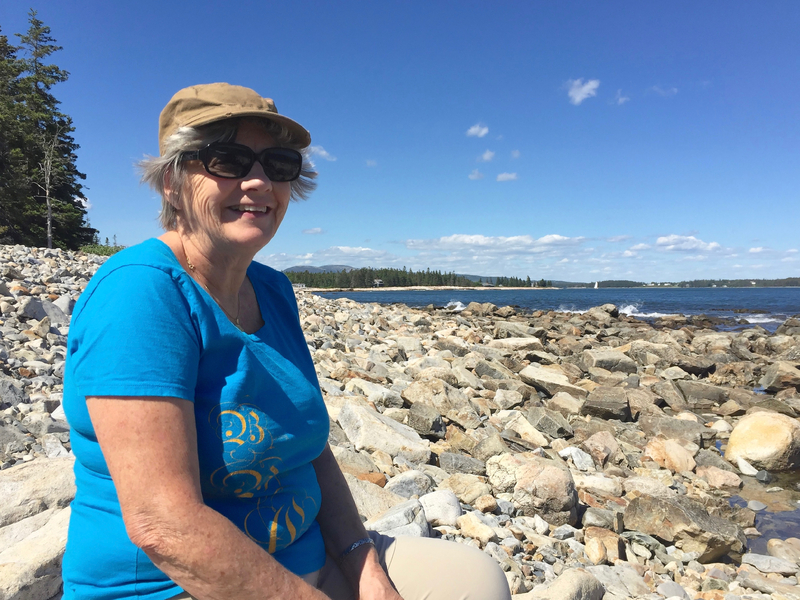 We headed off to Acadia National Forest, where we had Seawall Campground reservations. (https://www.recreation.gov/camping/seawall-campground/r/campgroundDetails.do?contractCode=NRSO&parkId=94719) The weather on our first day was rather threatening so we headed off in the 917 to the main Visitor Center to watch the movie and gather information. We are unfortunately too tall to complete the Park Loop, due to a number of low bridges, though we were able to do a section of it. We enjoyed a lovely lunch at the Upper Deck in Southwest Harbor; Denise ate her first lobster roll and thoroughly enjoyed it. (http://www.globeater.com/view-restaurant/?restaurant_name=The%20Upper%20Deck%20-%20Southwest%20Harbor,%20ME&id=1610) After returning to the campsite, the weather had improved so we had a walk in the surrounding forest, offering ourselves as a sacrifice to the myriad Maine mosquitos and miscellaneous flies. Highlights of the stay were two bike rides, one to the Bass Harbor Lighthouse at the point about 2.5 miles from our campground and one on one of the carriage roads in the National Park. Both days were beautiful and it felt wonderful to be back on the bike again. After watching the chaos in the tiny lighthouse parking lot we were most happy to be on our bicycles and not in the 917! 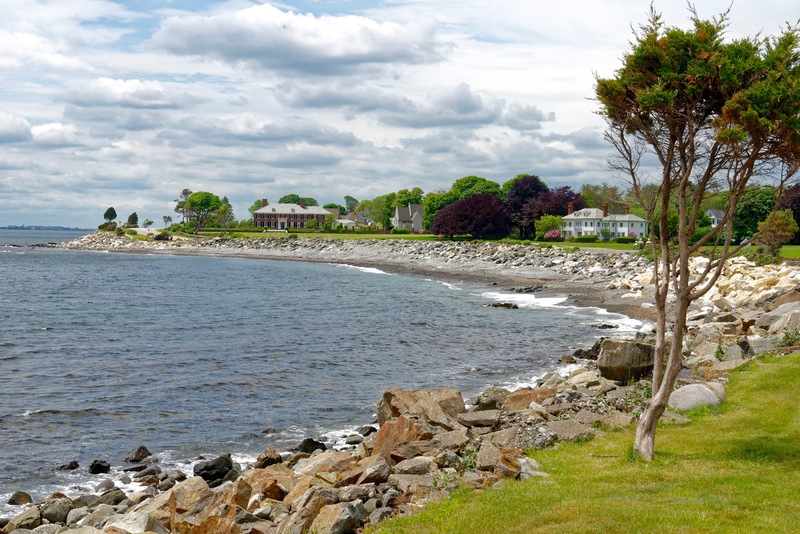 In the afternoon we walked over to the Seawall Picnic Area and enjoyed watching the waves breaking on the rocky shore. We also spotted Mrs. Duck with at least six ducklings swimming along in the surf. We did not know that ducks ever swam in the sea! 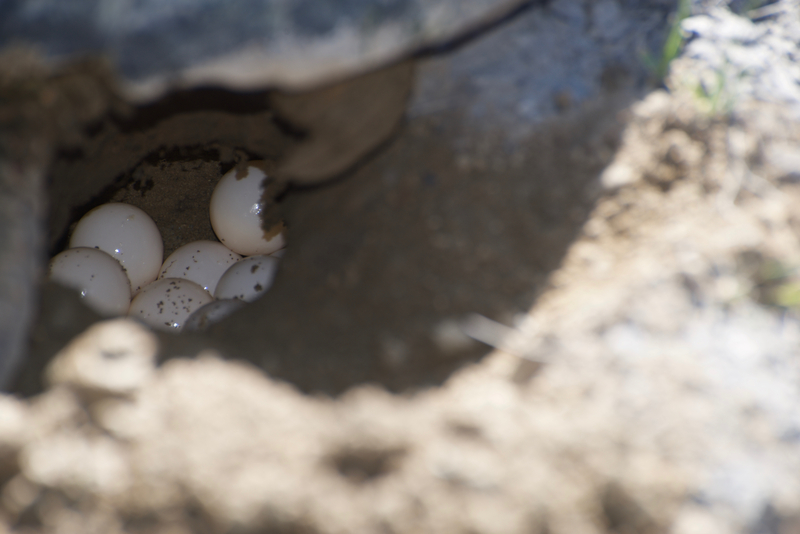 Some of the ducklings had a hard time in the surf, but they all paddled furiously back to mum. 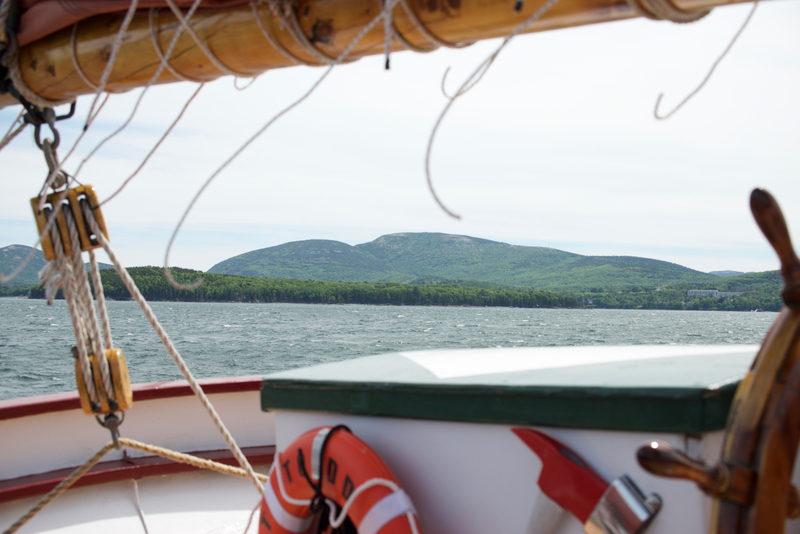 We enjoyed the beautiful views before heading out to Bar Harbor and a schooner ride on the Margaret Todd. (https://downeastwindjammer.com) It was such a beautiful afternoon it was wonderful to be out on the water. Unfortunately, Fred’s ball cap blew off in the wind so we had to buy him a new one on our return to Bar Harbor! This entry was posted in RV Travel on June 28, 2018 by DiploStrat. Back into the mountains, we looked for a campground to spend the night and do all our laundry. 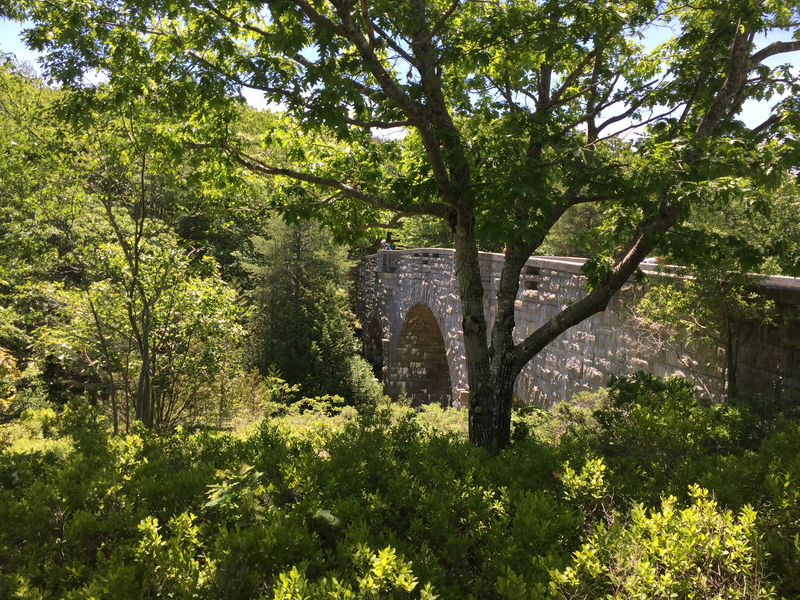 We found a lovely one called Terrace Pines near Center Ossipee, and acquired a campsite beside the Little Dan Hole Lake. (http://terracepines.com). A beautiful site, which we enjoyed as we completed our three loads of laundry. The is the type of picture that they always used to use to sell Blazers, Broncos, and Jeeps! Where too the mighty moose, wanders at will. We were warned about the bears and there are moose around but we have not seen either! But we have seen lots of tiny red squirrels (smaller than the DC ones) and chipmunks and the Blue Cat had many meaningful conversations with the squirrels. That is, they hurled deprecations at him from a safe distance up a tree! MountWashington in the distance, with its famous windy clouds. 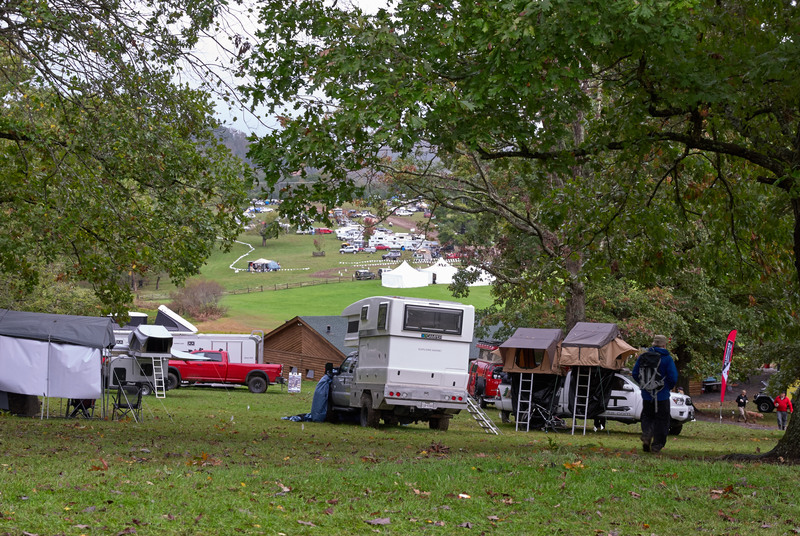 As the Cog is part of Harvest Hosts, we had arranged to spend the night in their RV Car park, which turned out to be a huge area so we had no difficulty finding a space. 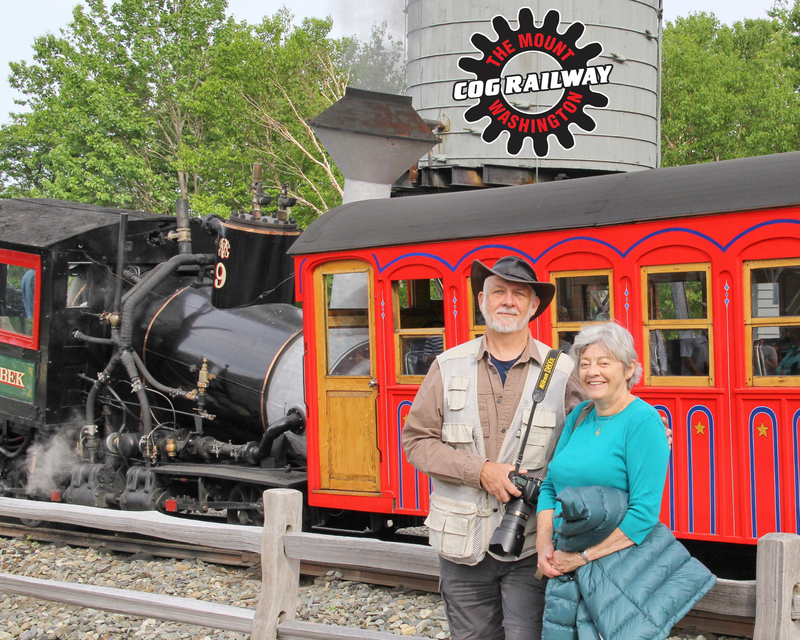 The Cog bills itself as the first of its kind, but the folks at Cadillac Mountain in Acadia will tell you that the first actual cog track was actually taken from a smaller such railway built up Cadillac Mountain. Early the next morning, we gathered our warm clothes and presented ourselves for the ride in what looked to be good weather. The ride up was lots of fun but it got cooler and cooler until we arrived at the summit with a temperature of 40F and a windspeed of 40 mph, which equates to a wind chill temperature of about freezing. Boy was it cold! It was even colder than that! We headed for the snack bar and found hot chocolate and a snack or two, both much needed. We braved the elements for some photos and to watch the end of the road race up the Mt. Washington Road. We could not believe the runners who had run up the mountain in running shorts and shirts in those temperatures. Once their time was clocked in, they could be seen huddled in purple blankets. We slowly warmed up as we descended and returned to the 917 for a much needed thaw out and lunch. Jacob’s Ladder, the steepest part of the climb. We then set off on the road into Maine. This entry was posted in RV Travel on June 27, 2018 by DiploStrat. 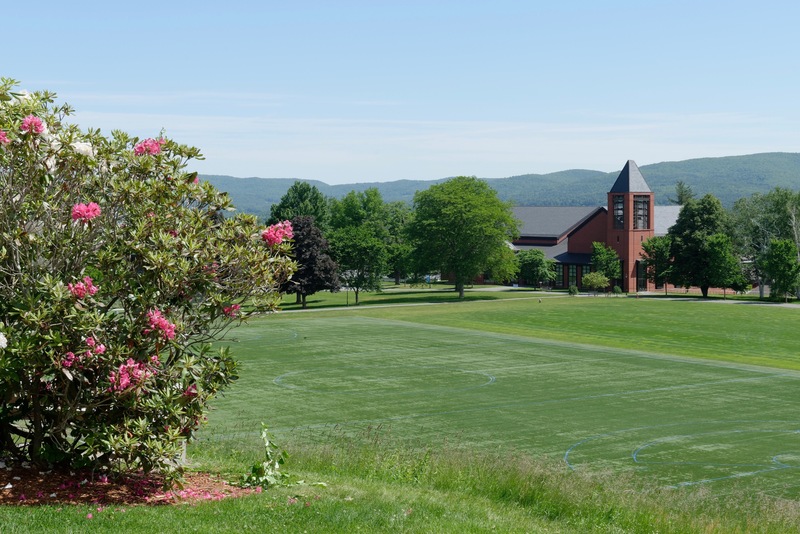 The weather was glorious for the entire weekend and NMH was at its best. A fun weekend with lots to do and friends to see. 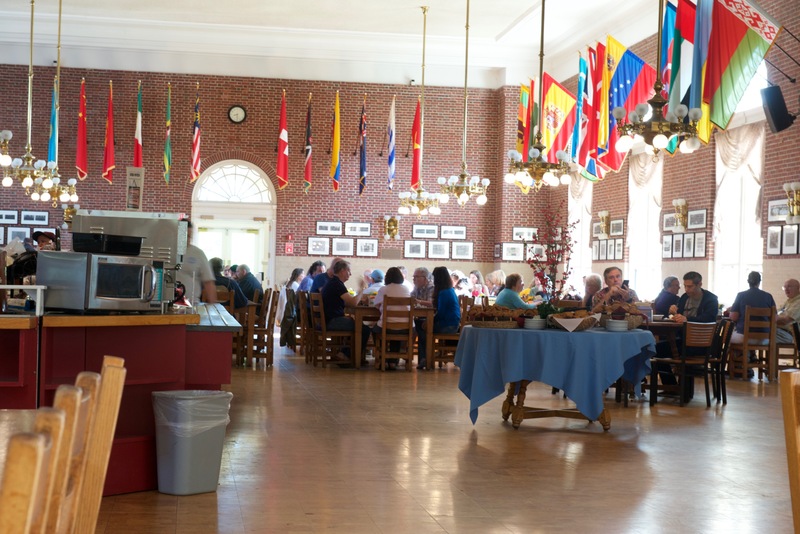 Fine dining in West Hall – as it never was in the old days! A personal high point was an hour long 60’s revival concert with Fred playing with members of two bands from back in the day, the former school sponsored band, the “Hermon Knights” (a word play on “Hermonite” the name for a Mount Hermon student) and the “Recitation Parking Lot” a band named, with tongue in cheek, for the place where the buses picked up the Northfield girls to take them back to their campus. 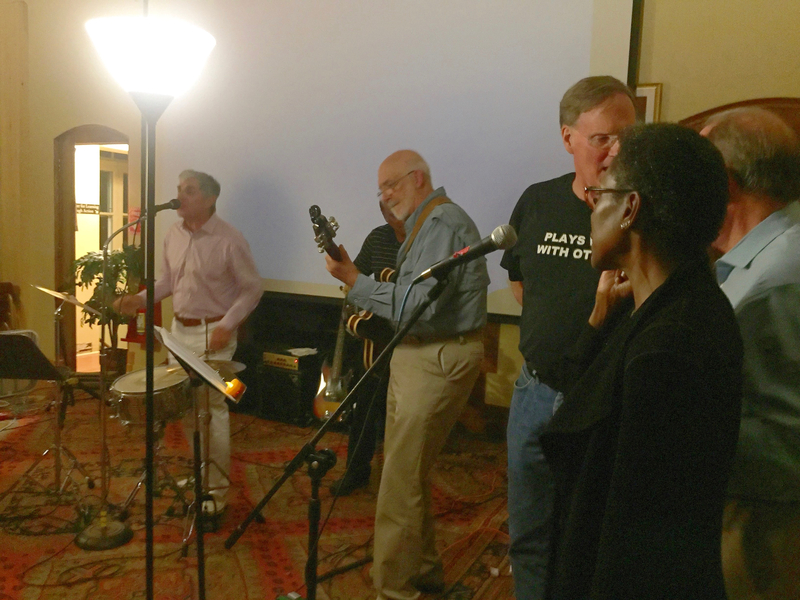 Also known for another school tradition – “Animal Hour.” Fred was happy with his playing and the crowd was out of their seats and on the dance floor, a universal sign of success. As members of Harvest Hosts (https://harvesthosts.com), we then moved into Vermont to spend the night at the Autumn Mountain vineyard near Brandon. We arrived in time for a fun tasting and found a variety of fruited wines, some of which tasted like Kool Aid! Others were quite good and we acquired a bottle of cranberry wine, which we both liked. (http://www.vermontwinerycabins.com) After a pleasant night amongst the vines, we headed back towards New Hampshire over the Brandon Gap, with some lovely views of the wooded mountain slopes both near and far. 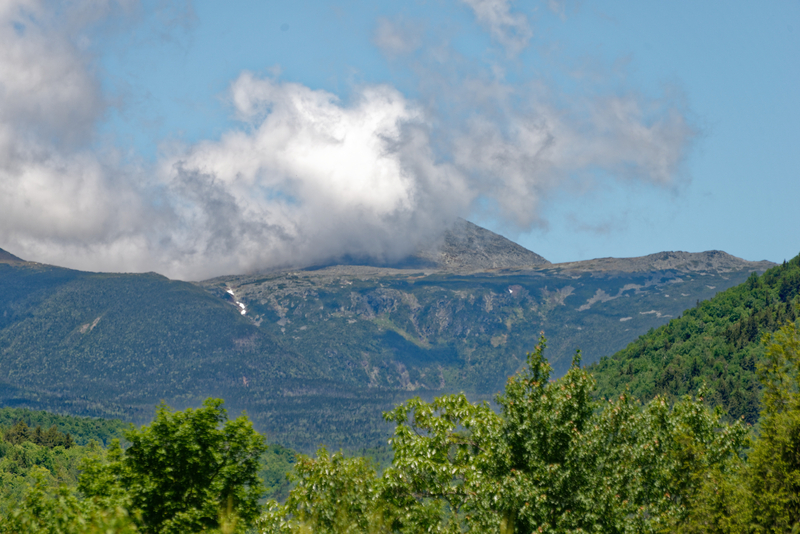 One nearby mountain rejoiced in the name Mt. Horrid! We wish we had stopped to take a photo of the sign! It looked like a normal mountain to me. 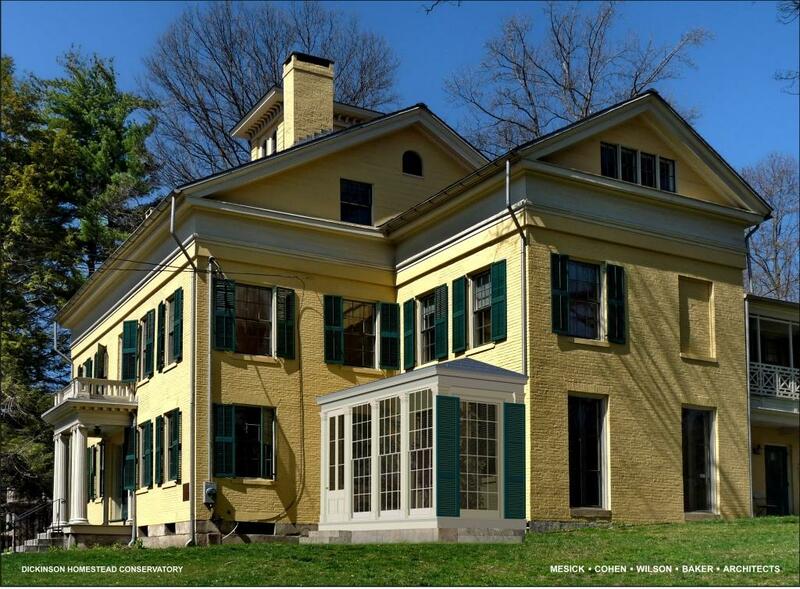 Denise wanted to visit Strawbery Banke, a preserved neighborhood with 32 historical buildings from the 1700’s. (http://www.strawberybanke.org) Most are still in their original locations. The name was given because the first English arrivals found wonderful wild strawberries there. The name was later changed to Portsmouth as the area, first a fishing town, became known for shipbuilding and became more respectable! 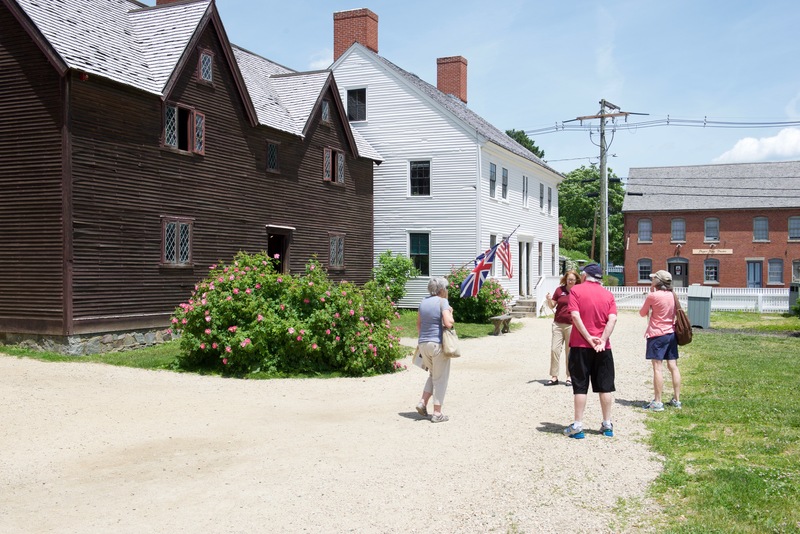 We enjoyed the visit and exhibits of early building techniques and also wandered down to the Piscataqua river bank to admire the view and the boats. 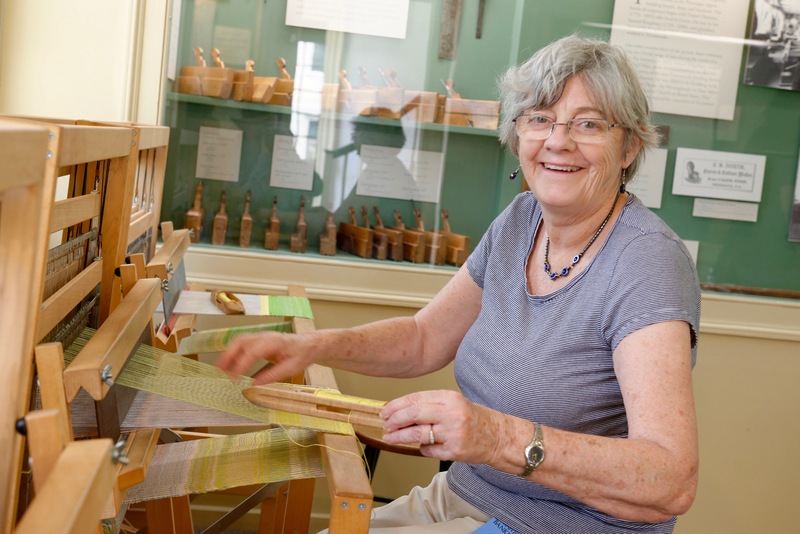 Denise develops a new hobby – weaving. We also discovered that the refrigerator had died again, for the third time! This was annoying to say the least. 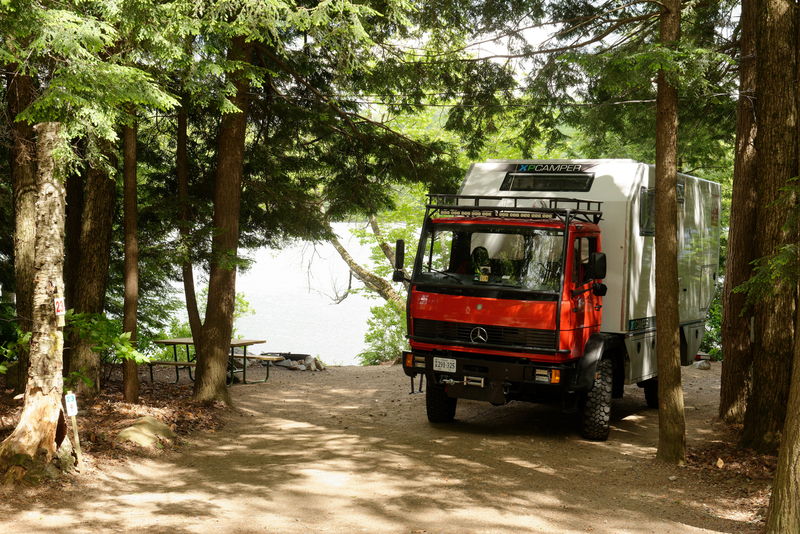 After an unsuccessful visit to a local dealer, we called the manufacturer, Thetford, who were most helpful and immediately agreed to ship a new one to the dealer of our choice in Maine. After several calls, we were able to set this up with a dealer in Bangor and get the new fridge installed. So, we bought a cooler and with a daily ice purchase are managing to keep cool bare essentials, as we await shipping information. 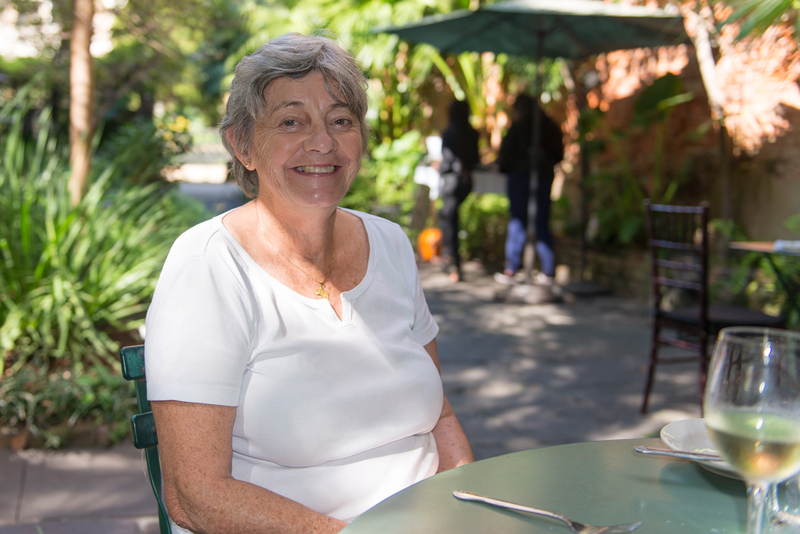 Before leaving the area, the following day we visited the Fuller Gardens in North Hampton, a lovely private botanical garden. (https://www.fullergardens.org) The roses and dahlias were not yet in flower but the rhododendrons were beautiful. After a stroll along the coastal path to admire the ocean and the huge seaside mansions, we headed for a seafood lunch at Rays of Rye. (http://www.raysseafoodrestaurant.com) As the sign says, “Lobzsta!! !” And fried clams for a belated birthday lunch for Fred. This entry was posted in RV Travel on June 24, 2018 by DiploStrat. So, armed with a couple of boxes of enough camping equipment to get us home, we flew to Grass Valley, California, the home of XPCampers, to pick it up. 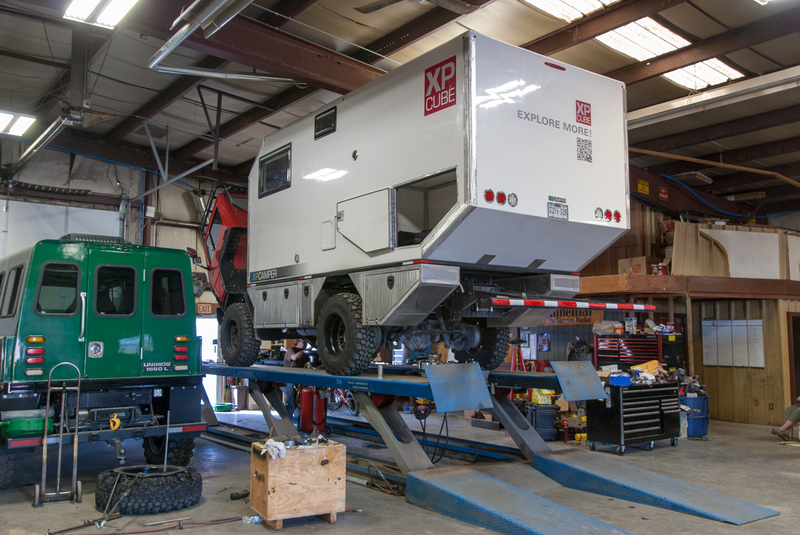 We had previously seen the XP and knew we would love the camper part. After a few tweeks and a few additional purchases, we set off over the Sierra Nevada towards Route 50, through Nevada and Utah. This was a route we had taken and enjoyed in 2016. We even managed to stay at the Cave State Park Campground just east of Ely, Nevada, so we could have dinner in the Chinese restaurant on Main Street. We had enjoyed our lunch there on our previous visit to Ely in 2016. In Utah we took a detour off road, down Route 21 towards I-15 to so we could test our new vehicle on dirt. It drove beautifully and we were pleased. We had made plans to visit La Junta, Colorado to get some work done at Rob Pickering’s shop, Terry Lee Enterprises. (http://www.terryleeenterprises.com ) Rob is an expert on Unimogs and old European trucks and, because of the 917’s age, we had arranged that it be completely inspected and overhauled. We had no idea when such basics as an oil change had last been done and were sure that other issues would come to light. As indeed they did, although somewhat sooner than we expected! While on I-70, about ten miles from the Colorado border, just west of Grand Junction the truck began to swerve violently. Huge clouds of smoke appeared in the rear view mirror and keeping the vehicle on the road was a major challenge, especially as we were being passed by a tractor-trailer at the time. Things were quite sporting for a moment, but Fred was finally able to pull over to the side. We got out to take stock of the situation. We had a shredded and burned tire, minimal tools, and only one jack. Fortunately, we had good cell phone service so we called for roadside assistance and with the aid of the charming gentleman who responded, we mounted the spare. A this point we discovered that the problem was not a defective tire, but rather that four of the 40 bolts which held the two halves of the wheel together had sheared off. And we still had Monarch Pass ahead of us. The manufacturer of the wheels basically told us that it was our fault, implying that we kept driving on a flat tire – NOT a company that we would ever recommend! Grrr! Denise points to the missing bolts. We continued very cautiously towards La Junta, checking the wheels every hour or so. 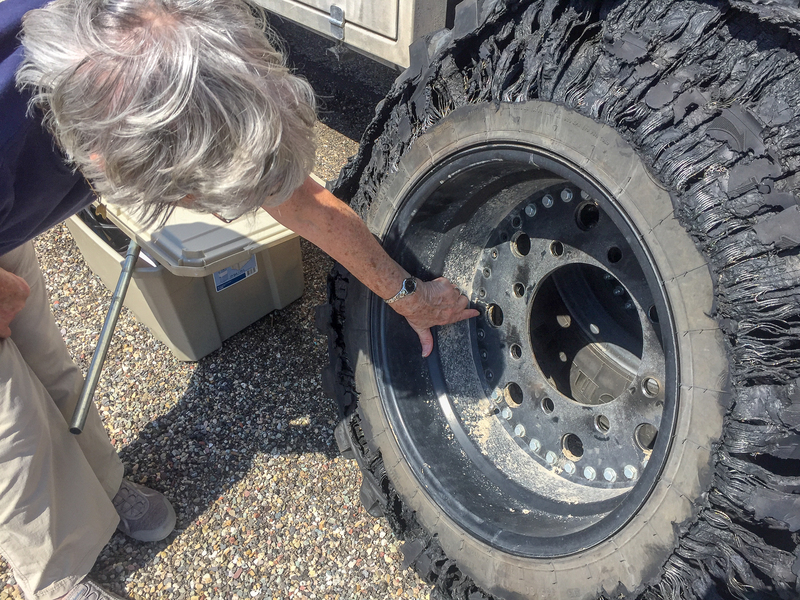 We replaced several more bolts on other wheels as they sheared off, before arriving at the KOA campsite in La Junta on the Sunday evening. The next morning we presented ourselves bright and early at Rob’s shop and set out the list of what was needed, which now included new wheels, as we could not drive further with the current ones. We spent about four days in La Junta, waiting for the wheels to be delivered and planning the truck’s renovation. Among other tasks, all fluids and filters were changed, the spare tire was moved to the rear, and, to Denise’s delight, we installed swing away steps on the cab. We also ordered air conditioning for the cab and the camper. The 917 on the lift at Terry Lee Enterprises. Rob managed to find five wheels for us but it became clear that the wheels would not arrive in a time for us to make it to Overland EXPO East on time, so we decided to fly back to DC from Colorado Springs and return when everything was closer to completion. So we gave our money to Frontier Airlines and flew home. We discovered that the final direct flight from Washington to Colorado Springs on Frontier Airlines (ever or for the season, it was unclear!) would be on October 31. As we were flying with our cat, who, as a rescue, had probably never flown before, we wanted to make the transit as simple as possible. So we booked our flights and packed up a bit more camping equipment and headed off to pick up the 917, which was still not quite finished, but would be soon! Staying in it this time was impractical, so we headed to the Midtown Motel, which was in easy walking distance. (http://midtownlajunta.com) We ended up staying a week and now feel we know La Junta very well! It was a pleasant week, the motel was friendly and helpful and as a fridge and microwave were provided, we were quite comfortable. We did eat at the three best restaurants at least twice each! Meanwhile, the wheels had arrived and the tires mounted, the air conditioning installed and the camper battery charging system upgraded. Our patented “Twisted Sister” charing system – 24v to 12v and vice versa! During the weekend, we again borrowed the pick up and went exploring locally. One day we went to Boggsville, one of the first non-military settlements in southeastern Colorado. 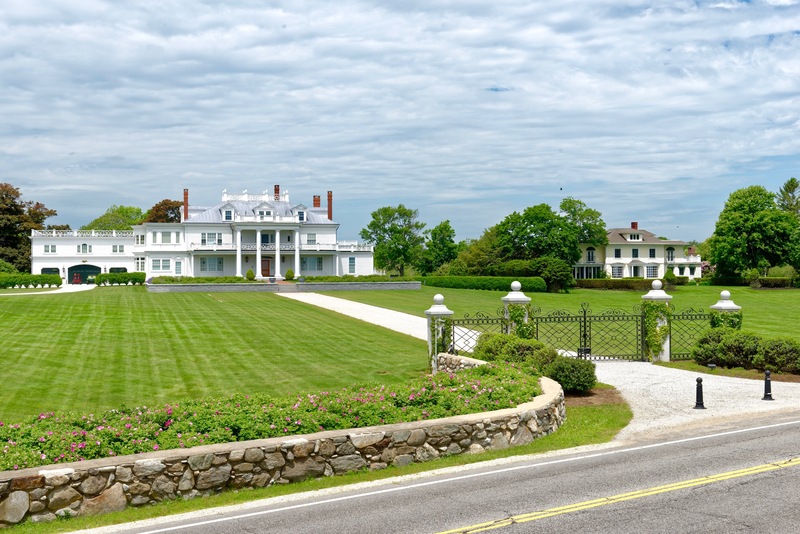 It was most prominent in the early 1860’s to the 70’s. The inhabitants were a mixture of Spanish, European and Cheyenne. 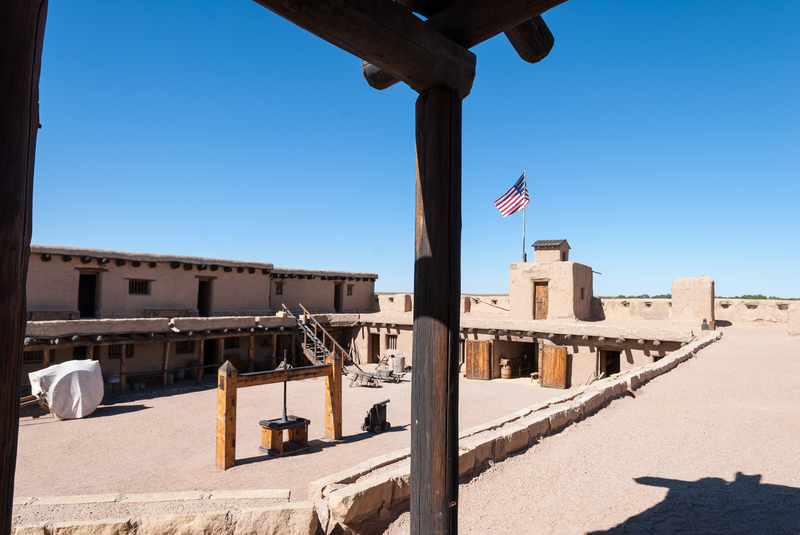 It was also the last home of Kit Carson, who died there in 1868. 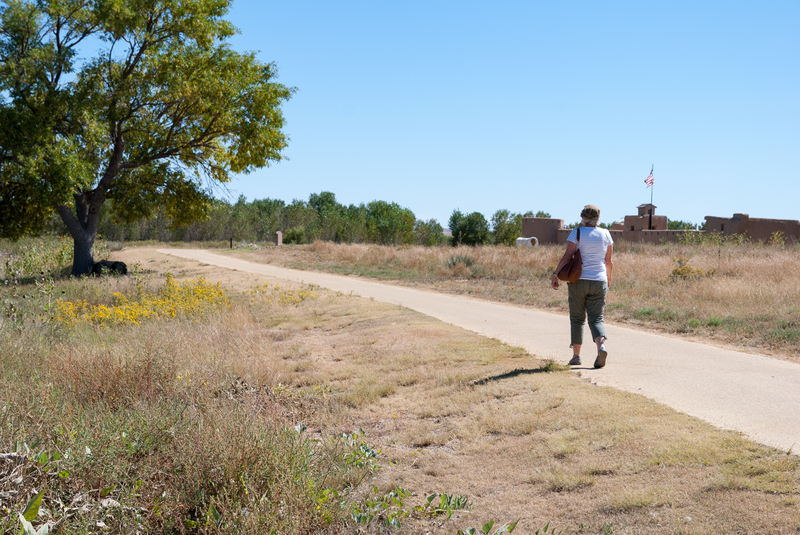 Several homes remain and the location is interesting, on the banks of the Arkansas River and on the Santa Fe Trail. The next day we went southwest of La Junta to the Comanche Natural Grasslands and Vogel Canyon. We enjoyed two short hikes within the canyon, one of which gave us a good view of the canyon as a whole and one of which led to some Indian pictographs on the cliffs. Then we set off, back on Route 50, heading indirectly south en route to Orlando, Florida. 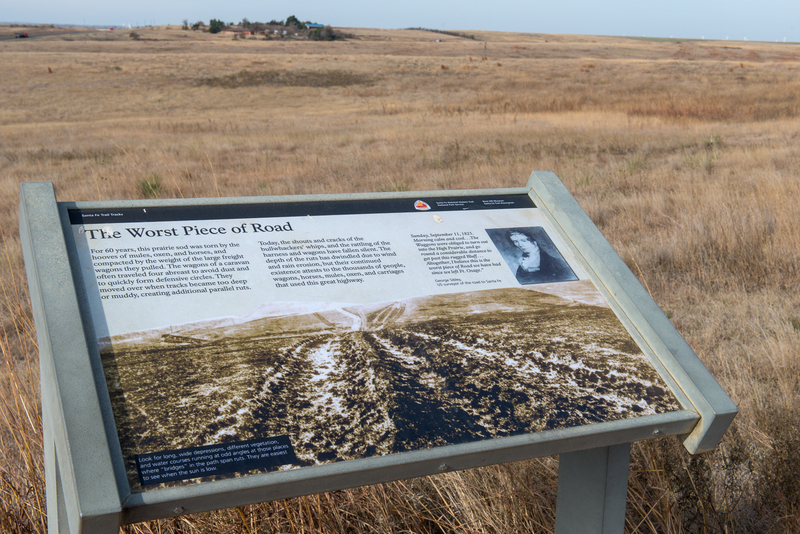 After getting interested in the Santa Fe Trail, we stopped briefly at the Santa Fe wagon track site, just west of Dodge City in Kansas. The grass was high at the end of summer so it was hard to see the tracks, just the irregularities in the earth showed where the wagons had been. We had a strict timetable for this trip so we were not able to discover Arkansas, though we were still following the river! We shall reserve that for a future trip. 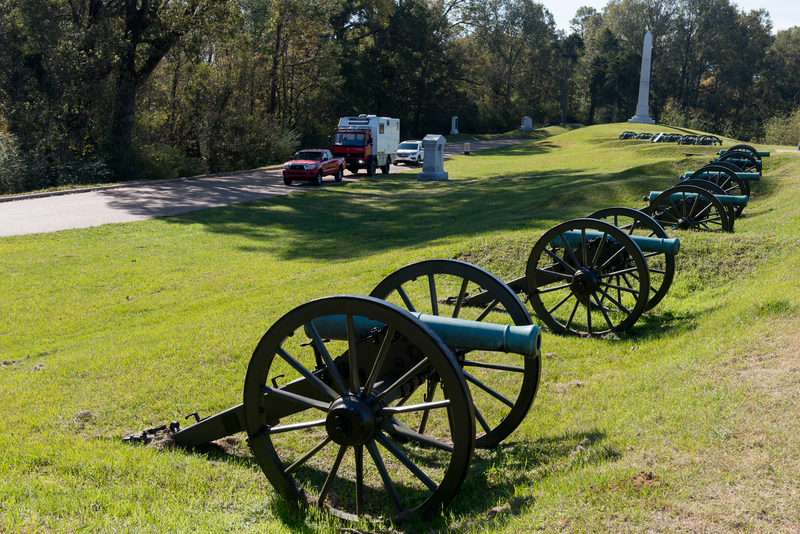 We did stop at the Vicksburg National Military Park in Vicksburg, Mississippi on our way south. We drove the battlefield, which is huge and of course visited the museum. After an overnight at a favorite campground on the banks of the Mississippi in Natchez, we continued south. We visited the Cemetery as part of a fascinating carriage ride. 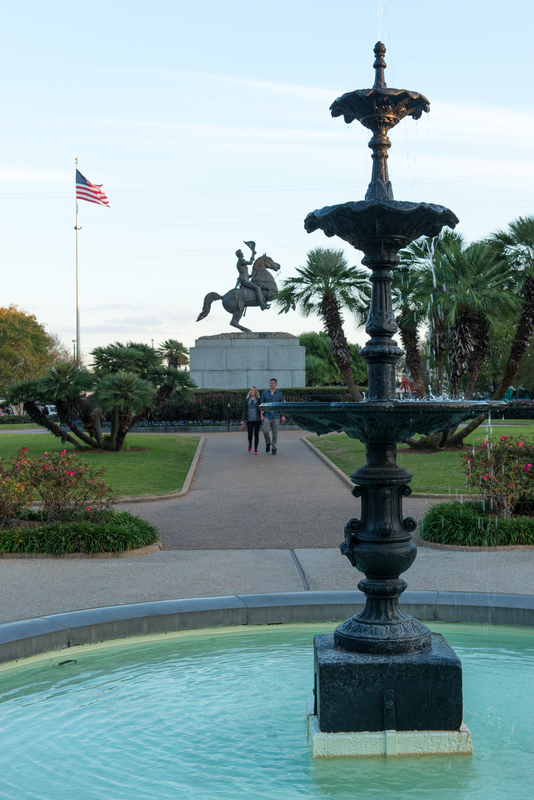 We sailed on the Creole Queen paddlewheel boat to the Chalmette Battlefield (https://www.nps.gov/jela/chalmette-battlefield.htm) to learn about the defense of New Orleans during the War of 1812. 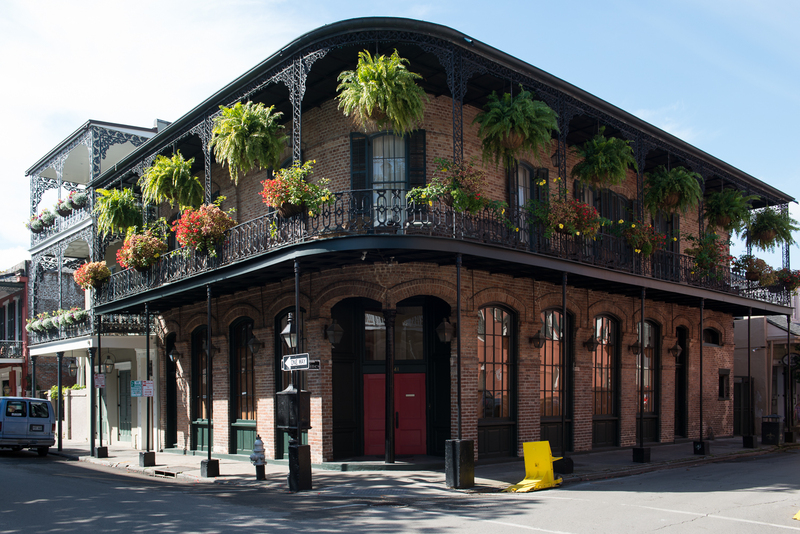 We shall most certainly be returning to New Orleans, there is a lot more to see! This entry was posted in RV Travel on June 2, 2018 by DiploStrat. 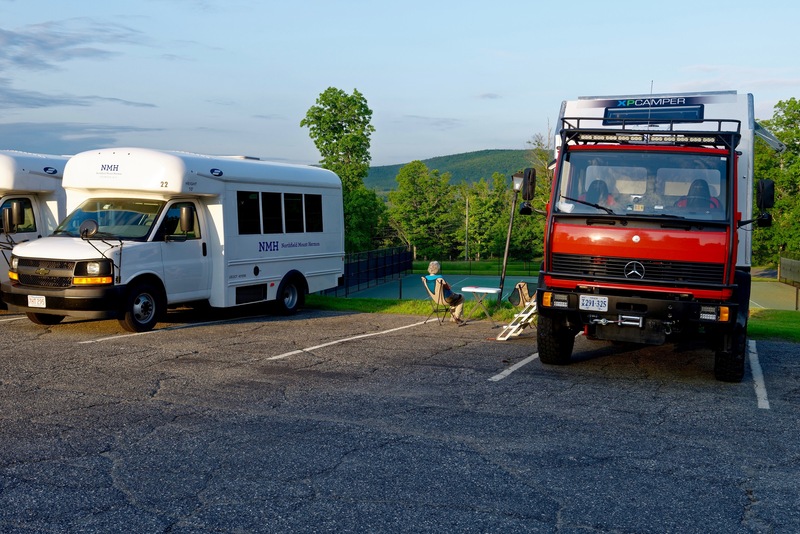 For those of us who dream of great both-ways-round-the-world overland trips, Overland Expo (http://www.overlandexpo.com) is always a lot of fun. 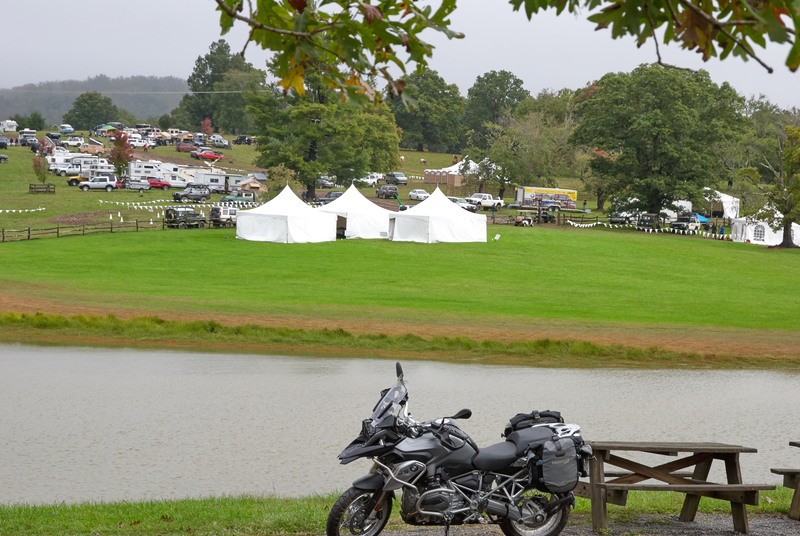 Sure, most of the folk who attend are really just four wheelers, but some are world travelers and, through round tables and other presentations, there is always the hope that we can persuade more Americans to be a bit less insular and combine their love of 4×4 with world travel. This year Overland Expo West was dubbed “Snoverland Expo” because a May snow storm turned Mormon Lake into a giant mud pit. (Took us several cleanings to make the floor of the Tiger acceptable.) 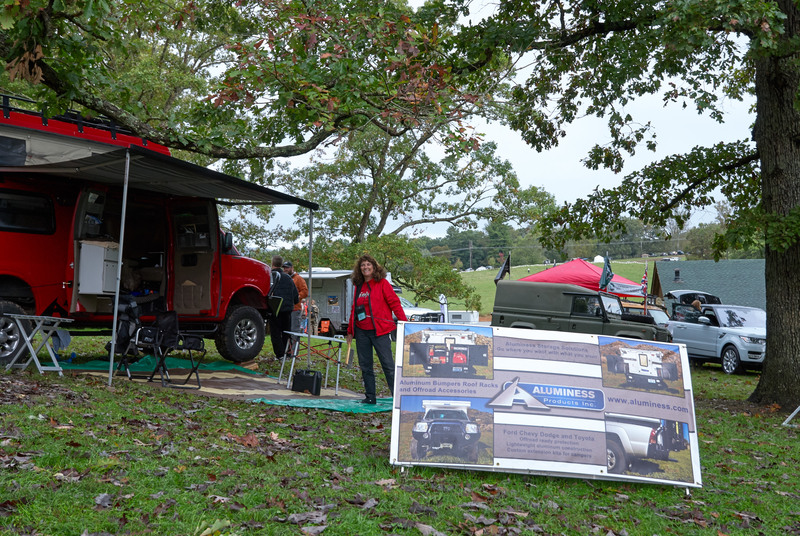 After that, we were looking forward to the colors and crisp Fall weather of Overland Expo East in Asheville. We did, however, take the precaution of buying a mat for the Tiger. 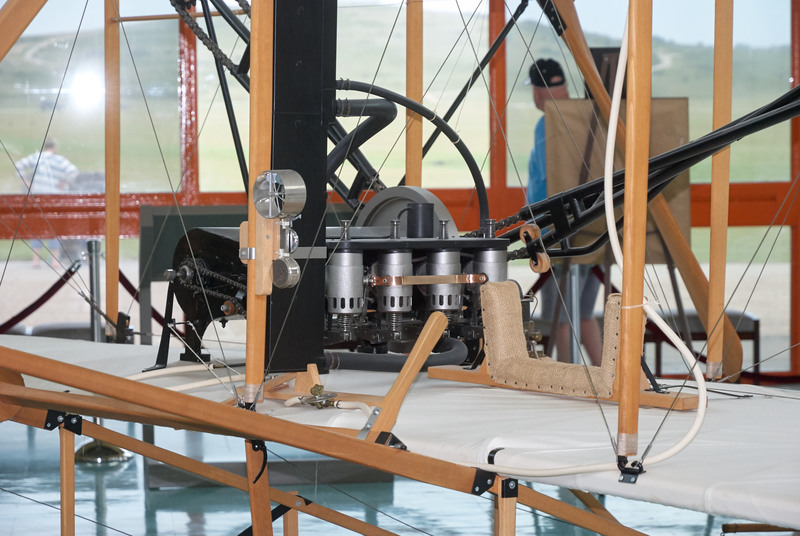 Rather than simply tanking down the motorway, we routed ourselves via the Outer Banks to visit aviation history with the Wright Brothers, to give Denise the opportunity to walk on the beach, and to gorge on seafood. (Essential pre-trip reading: http://www.amazon.com/The-Wright-Brothers-David-McCullough/dp/1476728747) We didn’t have constant, bright sunny weather – there was a huge storm coming, but neither did we have stifling heat. We visited the Wright Brothers Memorial and the Cape Hatteras lighthouse. Our first stop was the Oregon Inlet campground. (http://www.nps.gov/caha/planyourvisit/campgrounds.htm) No hookups, but you can use the dump station at a nearby marina. Denise could pop over the dune for her beach walk. We drove down to admire the relocated Cape Hatteras light at the “Graveyard of the Atlantic.” The stones are from the original foundation. And then drove to the original site. It was damp and blustery! 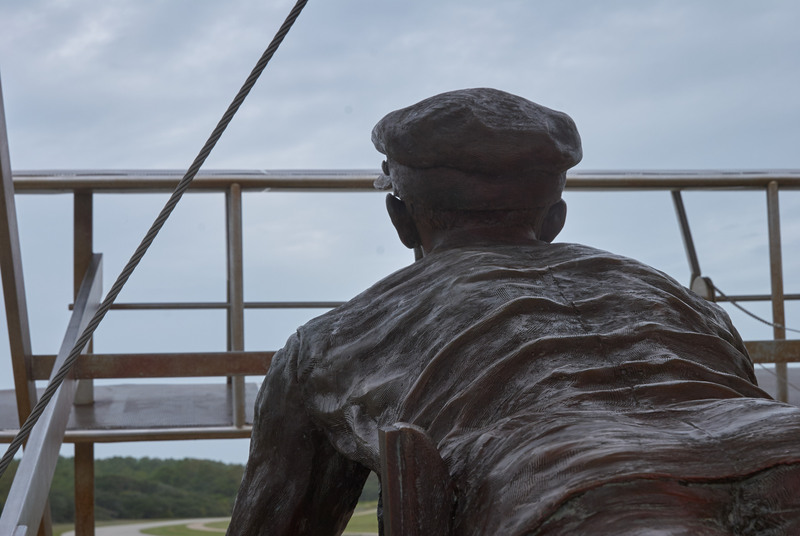 The Wright Brothers Memorial sits atop a large sand dune, now grassed over to protect it from the many visitors. 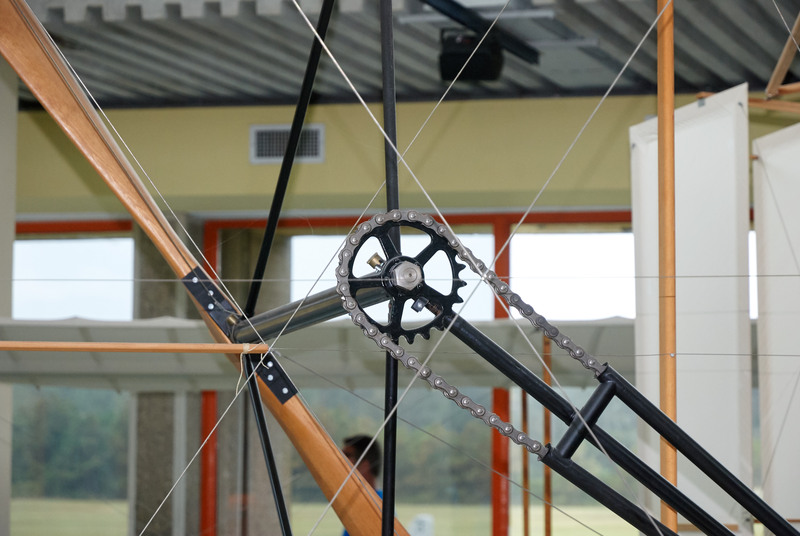 The hill was used for glider experiments during the first two summers that the Wright Brothers spent at Kitty Hawk. The actual flight took place on open ground in front of the dune. Today there is a recreation of the launching track along with stones marking each of the flights. Interestingly, the brothers were not worried about getting an airplane to fly; they considered that to be relatively easy. They spent most of the first two years developing flight controls and learning to control an aircraft. History proved them to be correct, the challenge was not to get the plane off the ground, but rather to guide it. Some of their first patents, and patent court cases, were over the controls that they designed. Behind the dune is a most evocative exhibit, a life size recreation of the moment of lift off. There are full size recreations of the buildings that the brothers construction to live in and to store their kites, gliders, and airplane. Conditions were Spartan and one year they were consumed by mosquitos. Note the beds up in the rafters. 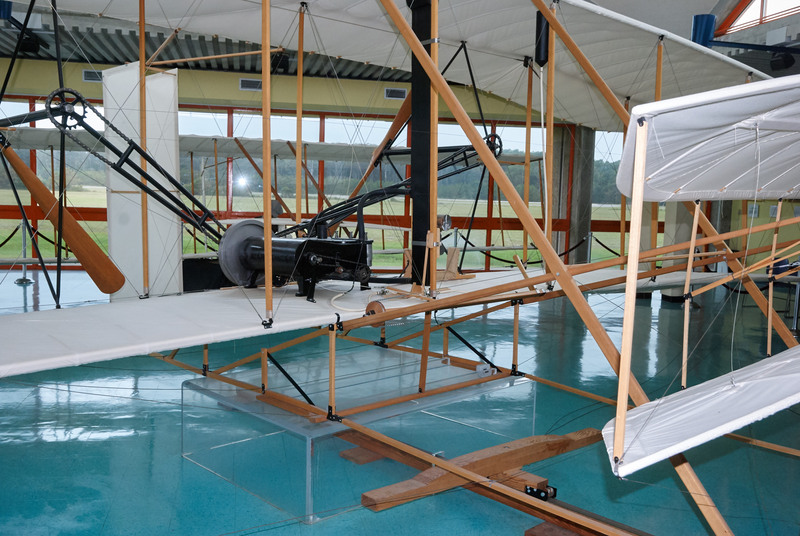 There is also an excellent museum, with full size, super detailed reconstructions of the second glider and the first airplane. You can see the bicycle DNA everywhere on the airplane. View of the “cockpit” with the engine to the pilot’s right. Leaving the Outer Banks, we heading inland through pretty, but not densely populated country. As we traveled, our morning cappuccino alarm went off and things were looking desperate. In the small town of Columbia, NORTH Carolina, suddenly saw a sign advertising espresso and dove off the highway. The establishment turned out to be the tasting room for the Wineries on the Scuppernong. (http://www.vineyardsonthescuppernong.com) The coffee was wonderful and we spent way too much money on nifty gifts. We continued on through Columbia, SOUTH Carolina, to pick up Number One Son and headed up the mountain to Asheville. 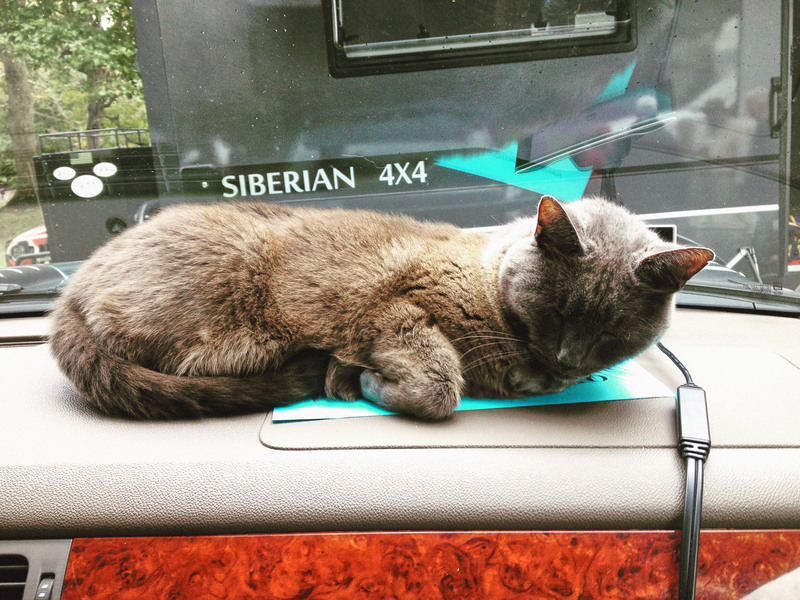 Norlina Bleu was unimpressed with the weather and settled down to snooze on the dash. He was supposed to be handing out brochures. A kraal of four Tigers. 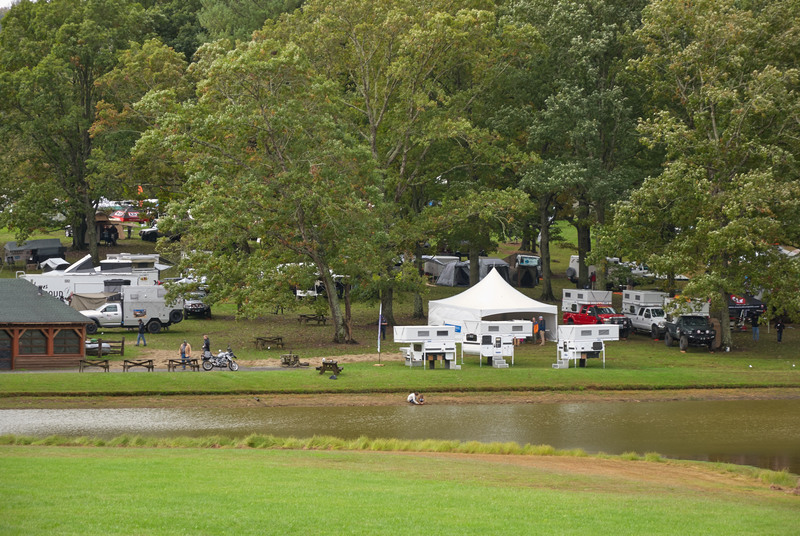 View of the exhibitor’s hill from the classroom tents. And the classroom tents across the lake. 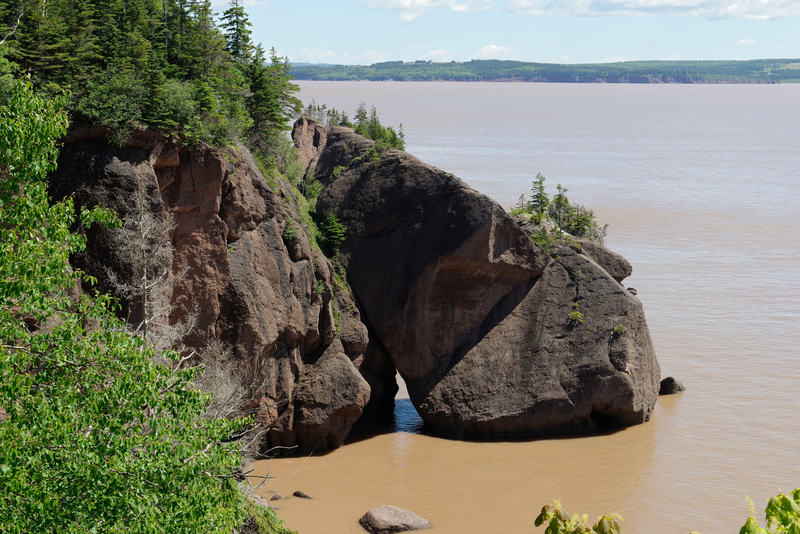 Camping areas are beyond. Denise and the proud owner of the new Siberian between two Tigers. 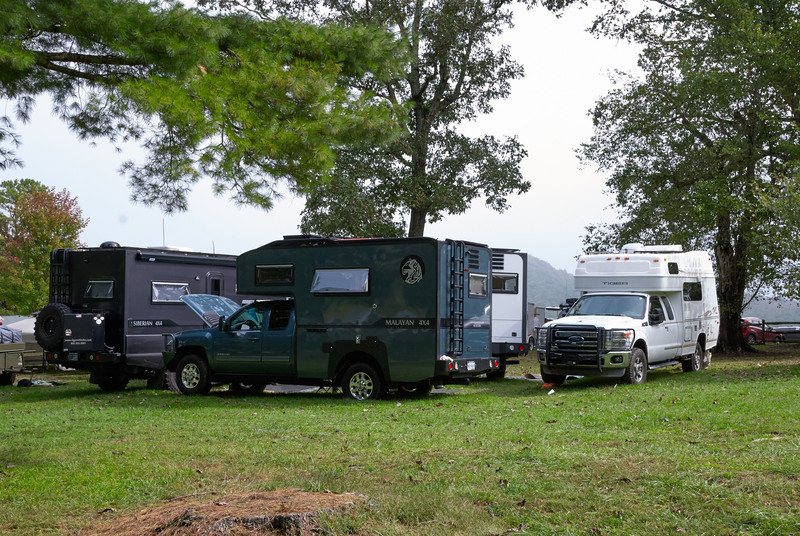 While the rain in Asheville was not as bad as elsewhere, coming at the end of a week of rain, the grounds got so soggy that they eventually had to turn day visitors away; there was no safe place to park. 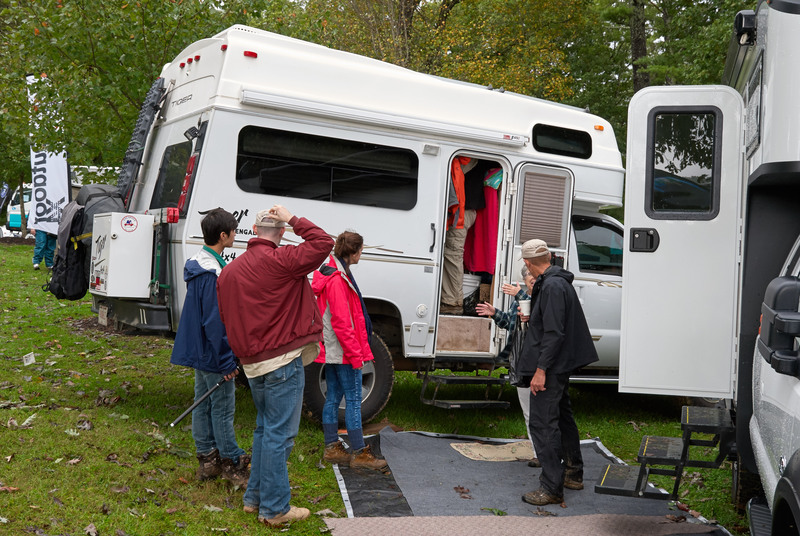 This entry was posted in RV Travel on October 30, 2015 by DiploStrat.